A few weeks ago I planned a birthday dinner for my best friend's birthday (albeit a few weeks after her birthday, but we're busy people!) Having NO idea what to actually make for her, I decided to stalk her Pinterest boards for inspiration. That turned in to a Pinterest-themed dinner, and each dish was something she'd actually pinned wanting to try. The best part of it all, it was during the amazing addition of Secret Boards, so I was able to re-pin things I was considering without her ever knowing! This dish is a variation of one of the sides I made for her. The original recipe does not have chicken in the meal, but while eating it we both agreed that with chicken baked in it, it would be a great one-pot meal. Being that I love one-pot meals, and thought this was fantastic, I knew it wouldn't be long before it made our weekly menu! I cannot express how much I loved this dish. With the chicken it was a fantastic one-pot dinner, and without the chicken it was an amazing side. This dish was a great way to get my husband to eat spinach and lemon, two things he's not totally fond of! It really is a perfect guys meal that's been slightly womanized. 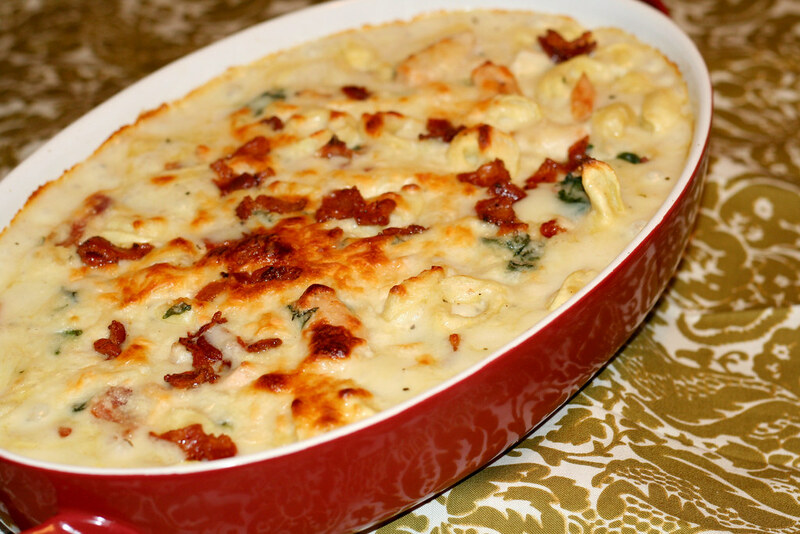 There's hearty pasta, creamy sauce, bacon and chicken. What's not to love? But then at the same time, it's light and fresh, but still filling. Preheat oven to 350 degrees. Fill a large pot with water and bring to a boil. Add pasta and cook according to package instructions. Drain and place back in the large pot until later. In a skillet over medium-high heat, cook bacon or pancetta until crisp. Remove bacon/pancetta with a slotted spoon and set on paper towels to drain. Keep 2 tablespoons of the dripping in pan and discard the rest. Add garlic to the pan and cook until fragrant and tender, about 1 minute. Add flour and stir with a whisk for about 1 minute. Slowly add milk and continue to whisk until smooth. Add salt, pepper, basil and red pepper flakes and bring sauce to a simmer. Meanwhile, zest the lemon, and remove the juice. Add 2 teaspoons zest and 1 tablespoon juice to sauce. (This is a decent lemon flavor, reduce amounts if you don't want a lot of lemon flavor). Continue to stir until thickened. Remove from heat. Reserve 1 tablespoon of the cooked bacon/pancetta and add the rest to the pasta pot. Add chicken, chopped spinach, 1/2 cup mozzarella and 1/2 cup of Parmesan. Add sauce and stir gently to combine. Put mixture in a greased casserole dish and top with remaining cheeses and bacon. Cover pan with foil and bake for 20 minutes. Remove foil and bake an additional 5-10 minutes until cheese is melted and pasta is bubbling. Remove from heat and let set a few minutes before serving. When I popped onto your blog and saw this photo, my first thought was, "Why isn't that in my belly???" That looks divine! Yum! Looks delicious! Do you know the nutrition facts or Weight Watcher points? You can with www.myrecipemagic.com. It's fun and easy, plus you can earn a little extra cash just by putting in your recipes! Hope to see you there!